This venue had a long history of providing entertainment for Londoners. In 1524 an inn named the White Lion stood on the site, and had a reputation for musical performances. In 1836 the inn was knocked down and Turnham’s Music Hall was built in its place. The building of the Metropolitan line at Edgware Road brought visitors from across London and by 1865 Edwin Winder had taken over the running of the theatre. Renamed the Metropolitan Music Hall, it was a great success. 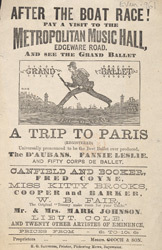 Winder staged variety entertainments, but it was for its regular ballets that the hall was particularly esteemed.